There are always fresh flowers in my home. My wife buys roses, gladiolas and lilis, mostly in red and white colors. “Red is for sales” -she says. Although I am not sure it is that which brings customers for my paintings, this season there have been plenty –thank God! It’s a good thing to have a wife who is an optimist anyway. Fresh flowers have become for me a symbol of a feminine presence, plus they turn places alive. Until now, I had painted very few flowers. I avoided the subject thinking it too common, while I am constantly striving to be original. Nevertheless, I have lately been thinking that my favorite subjects are pretty common: women, landscapes, fruits, chairs, peppers and ocean waves are. I am now realizing how fortunate I am to be surrounded by these subjects and to have them such at hand. 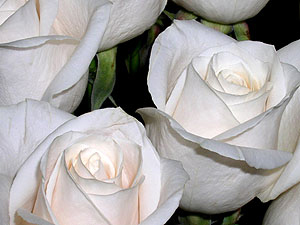 A few days ago a bunch of white roses captivated my interest at the entrance of my Estudio-Café in Nuevo Vallarta. They were the kinds that have a bit of a greenish shine to them –I wish I knew the name of the variety. The sun was hitting them from the side and back, which made some of them translucent against a dark background. I decided to paint them. They turned out to be very challenging because of their capricious shapes. I used a 20 x 30 inch canvas, horizontal. I painted a dozen roses. Five hours later I stopped. They looked alright, but this was not what I wanted, so I quit and started over, this time on a 3 x 4 feet canvas. I couldn’t finish that day, I was too tired. The next morning the roses had opened fully, so I was under pressure to capture them before they wilted. I again painted a dozen roses. A few hours later I stopped too, understanding then this was not what I was inspired to do. I had now two unfinished paintings. So I decided to start yet another painting, but couldn’t, until Luli would bring some new roses, which she did that same afternoon. Fully open roses gave the impression of being tired, suffocated; the new ones were young and erect, looking up. Now I began on a 5 x 6 feet canvas, but instead of painting the whole dozen I painted only six, very fresh and young. It was then when I finally understood my own motivation: when you come close to roses to smell their sweet perfume, their image cover your whole panorama, they kiss your face with dew and almost touch your eyes. So then, although these young roses measure only a couple of inches in reality, I painted them to be over one foot large on my canvas. I couldn’t stop working on this third trial. Everything worked to perfection. My creative passion arose. I painted over six hours non-stop. Then I quit only for lack of adequate light –I have stopped painting at night as I used to do when I was young. Next morning I went on for several hours, without noticing any physical need such as hunger or other. As results developed I became more and more excited. On the third day of this canvas I also painted the whole day, concentrating in details and final touches for the last couple of hours. These final touches always improve my work significantly. I then let the work mature in my mind and return to it in a few days, reviewing every stroke. 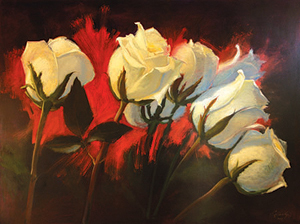 Once signed, I took the white roses on a dark canvas with red splotches to the Thierry Blouet Collection Gallery, downtown Vallarta. Once hung, it looked just splendid! Three days later it sold to a couple from New York city. Its interesting to see, that once things start to go right due to our relentless perseverance, everything gets better and better. The process made me appreciate how good it is to mature ideas, insisting on discovering their initial motivation, without compromising, without conforming to anything less than what we really wanted. While these roses were still hanging in the gallery, another customer came by, wishing to have them. So I sold a commissioned painting, same subject and spirit, slightly different dimensions and composition.